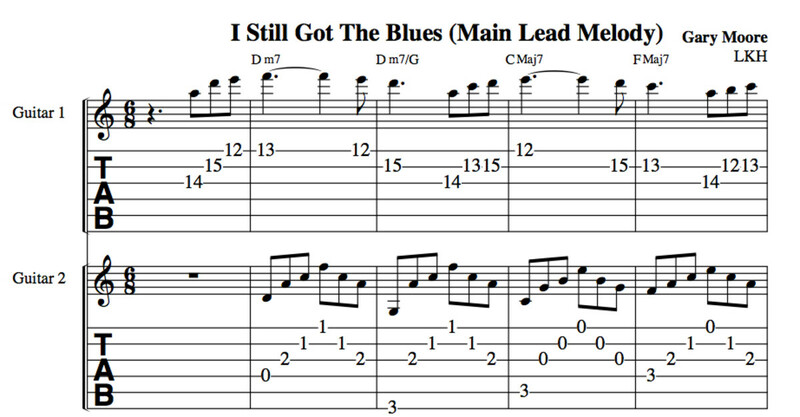 This is a breakdown of the rhythm guitar part to Gary Moore's I Still Got The Blues. This is an extremely well written song. Great vocals, lyrics, arrangement, and of course, some of the most soulful guitar playing ever recorded. 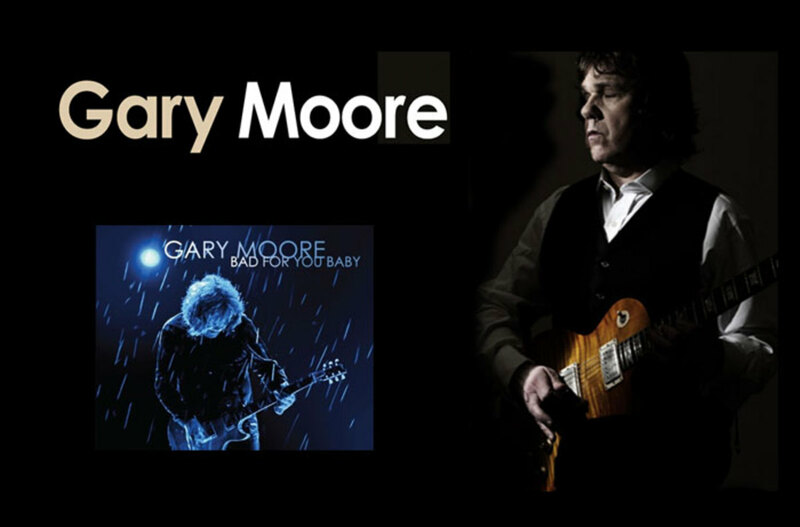 Gary Moore combined his metal roots with his love of blues to produce some of the most unforgettable playing ever. I remember reading a quote from Albert King. He was standing backstage watching Gary, and suddenly blurted out "dang, that kid can play". This is an understatement. This progression is a standard bebop progression. Bebop is a type of jazz originating in the 1940s and characterized by complex harmonies and rhythms. It is associated particularly with Charlie Parker, Thelonious Monk and Dizzy Gillespie. Usually played at fast tempos, this form of music was very popular. The time signature is six eight, counted 'one and ah, two and ah'. 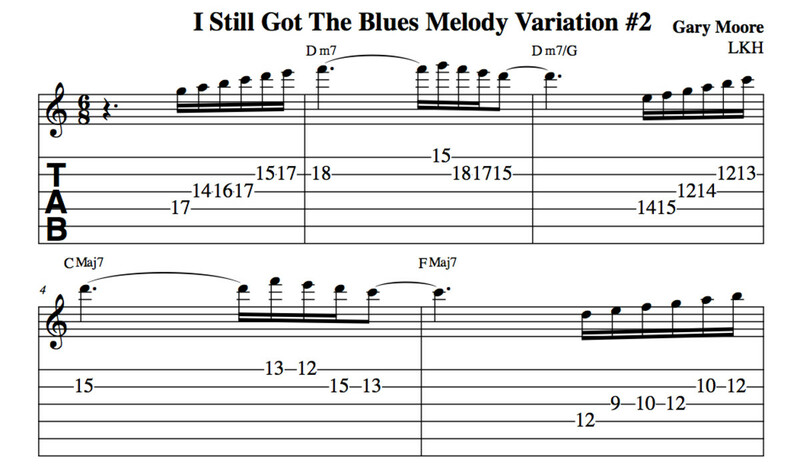 This results in a strong triplet feel, very common in blues music. The parent key signature is C Major. 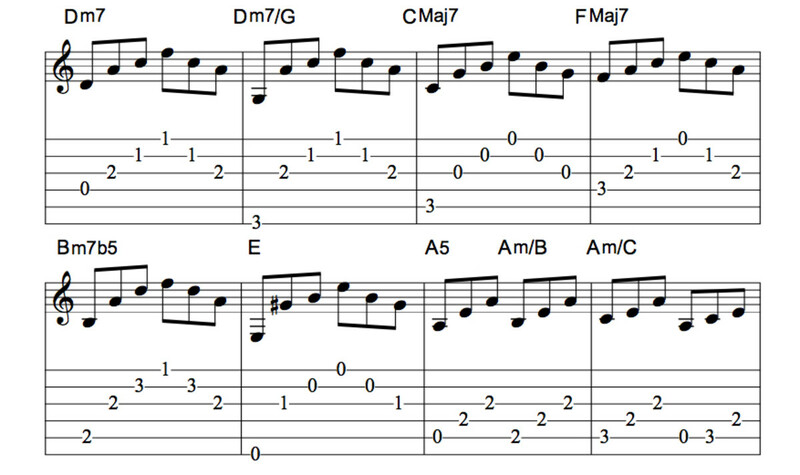 When improvising over the changes, think in A Aeolian (for more info on the modes see: Modes Of The Major Scale). In measure two, the D minor seven over G is a slash chord. 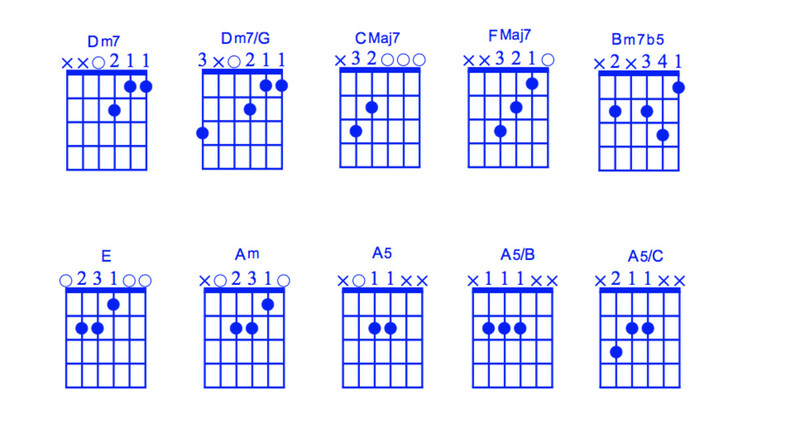 The G is the lowest note of the chord, and is duplicated in the bassline. In theory, the E Major chord in measure six, forces a G sharp into the Aeolian mode, turning the scale into A Harmonic minor. Scale spelling for this is: A B C D E F G sharp A (one octave). 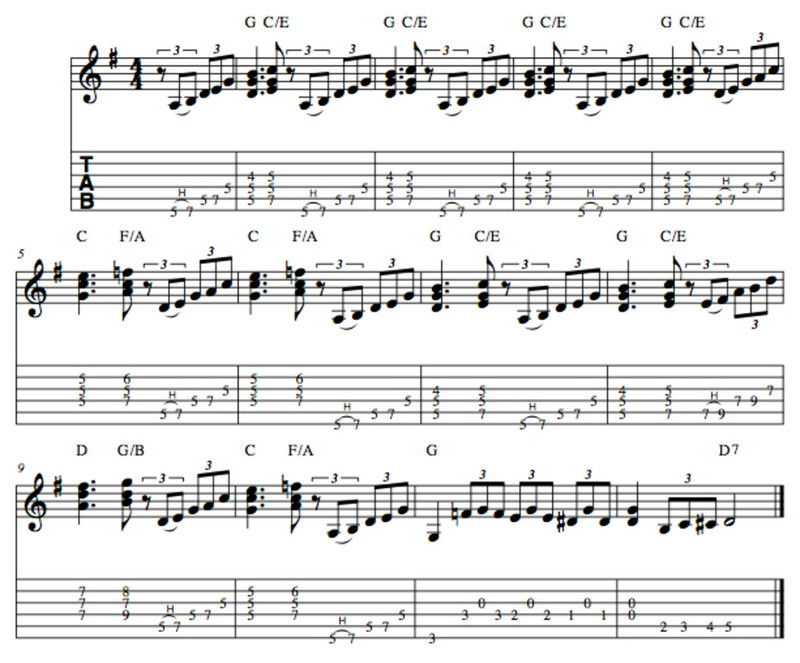 This is the only deviation from C Major (A Aeolian) in the intro, the verses, and the end loop. The verse structure is just a continuation of the intro. The A5, A minor over B, and the A minor over C, along with the repeating motif, leads back into the main verse progression. The two measures of E5 at the end of the verse, transition into the choruses. 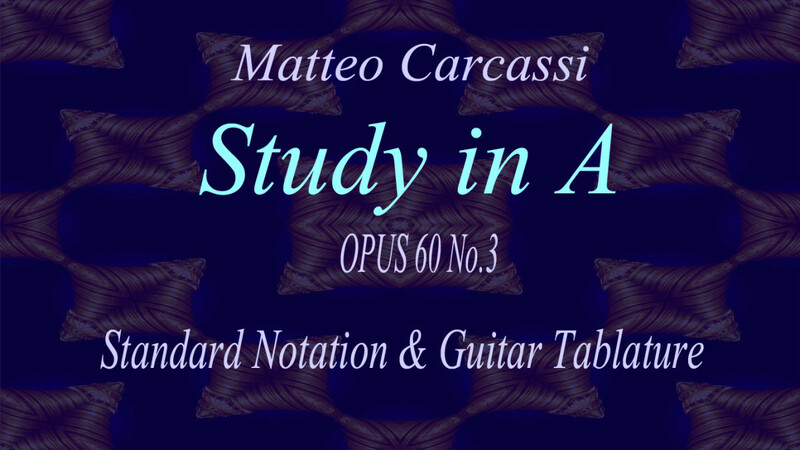 When playing these, or any arpeggios, I always tell guitar students to form the whole chord, even if you are not playing some of the notes. That way, if you miss-pick one the notes, at least it will still sound like the chord. A good example is the C Major seven chord. Place your second finger on the E on the fourth string, to form the entire chord. If you happen to miss the C bass note and pick the E instead, at least it will sound right! The dot above the chords is a staccato mark. Cut the chords off to create a short, sharp sound. This is achieved by releasing the pressure on the fret hand right after the strum, then quickly applying it again. This can be a difficult technique, if you are not used to it, but gets easier very quickly with practice. This results in a piano like sound, where the player hits the chord then quickly releases his hand, instead of holding his hand on the keys. Let the F9 and E7♯9 ring as long as you can, before moving back into the staccato sound for the A minor. All these techniques will make your rhythm guitar playing more interesting. Watch the video. The same technique that was used for the choruses could be applied to the bridge. However, to make this part separate from the chorus, try holding the pressure on the chords, but place a heavy accent on beats one and two. These are normal accents for a triplet sound. It tends to keep the beats distinct from one another. Try this even when playing single note triplets. 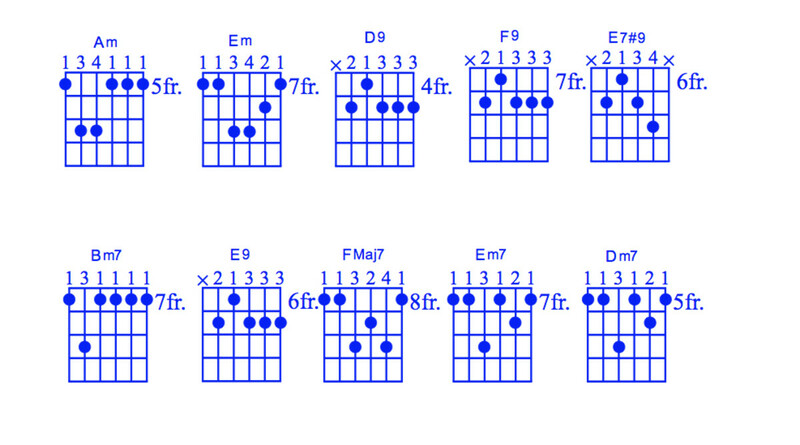 Moving from the E9 to the FMaj7 can be challenging, if you are not used to these shapes. If you have trouble, play them slowly. In fact, this is true with anything you play. If you can't play it slow, you can't play it fast! Move back into the staccato, fret hand release technique for this chorus. Play the E5 with heavy accents in measure eight. 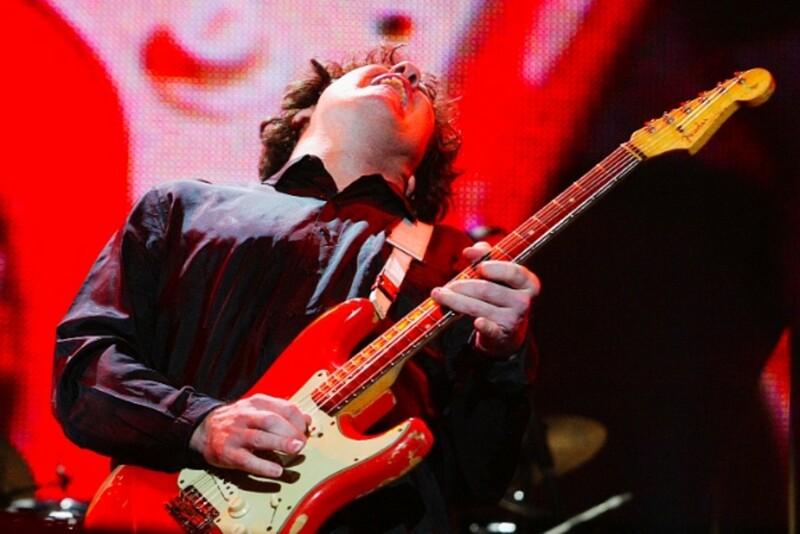 Gary performs a slide into this chord, very cool! The last F9 and E7 sharp nine are held for two bars as opposed to one. 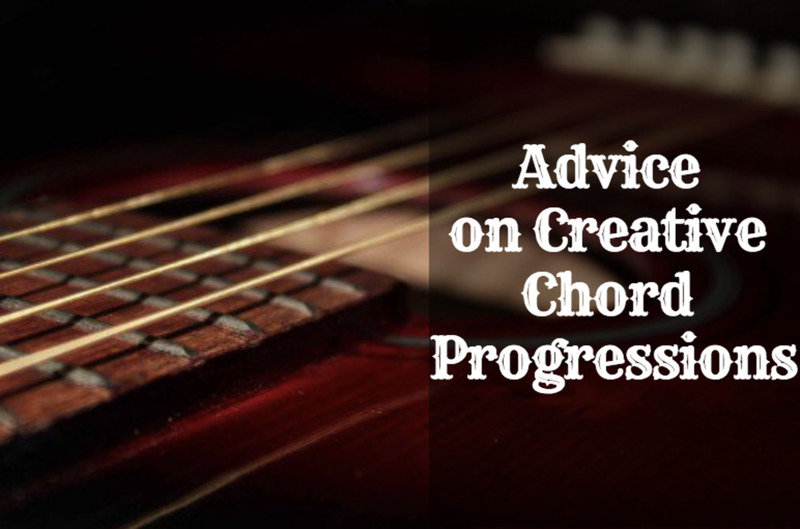 Once again, let these chords ring as long as you can, before you have to move your fret hand. This is the first half of the verse progression. This is the movement that is used under the long solo at the end of the song. 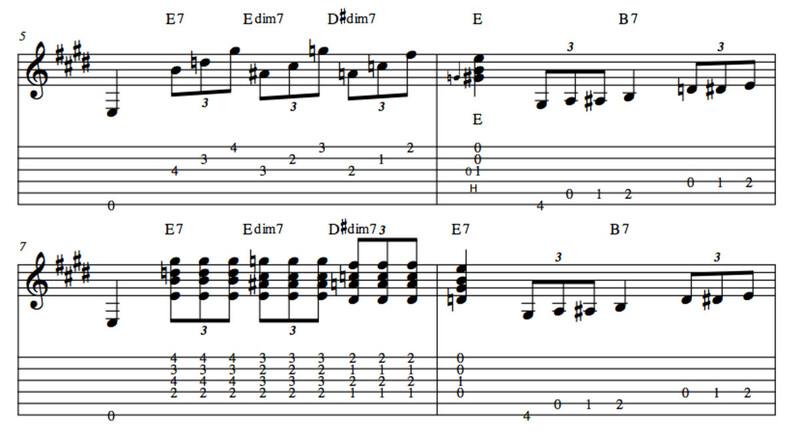 Use A Aeolian or A minor Pentatonic for the entire progression. These scales sound great over all the chords, even the E major. 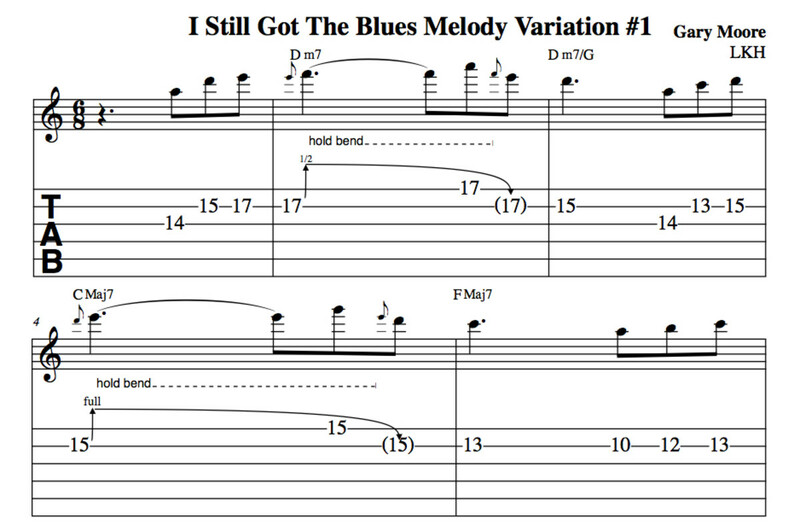 Quite often in blues, a minor third (in this case: G), is imposed on Major and seventh chords to lend a more gritty sound. 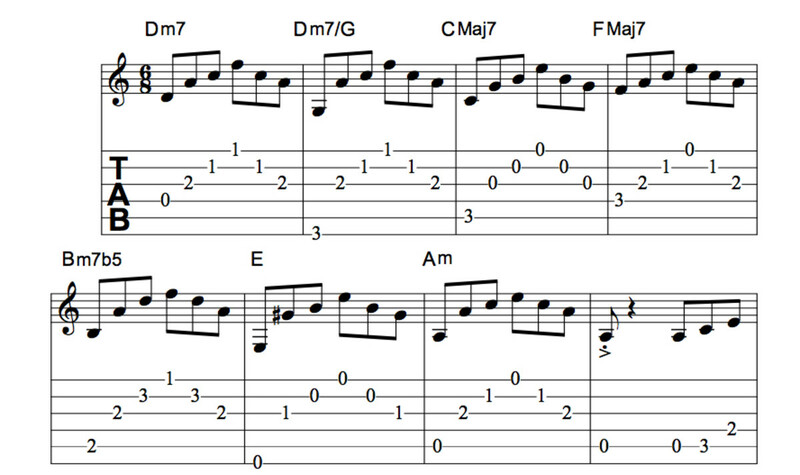 This note (G natural) is in the A minor Pentatonic scale as well as the A Aeolian mode. 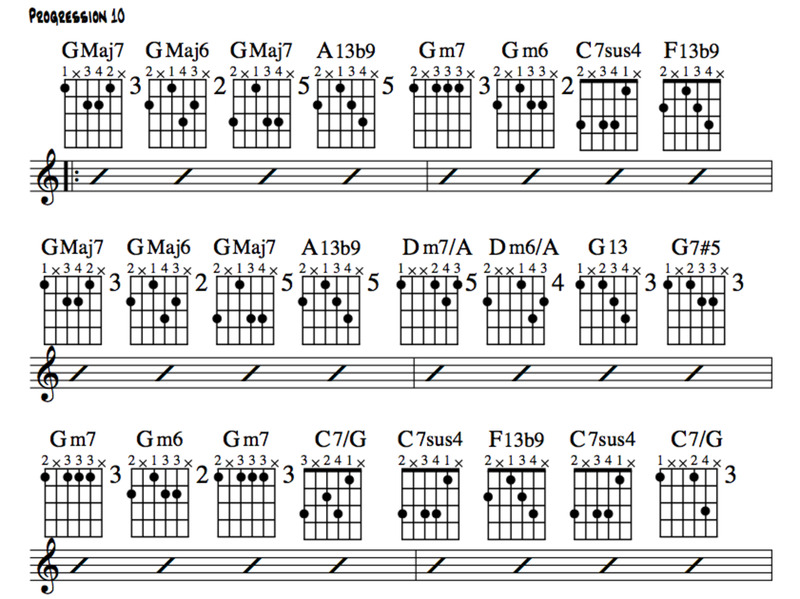 This is a great progression to jam on. 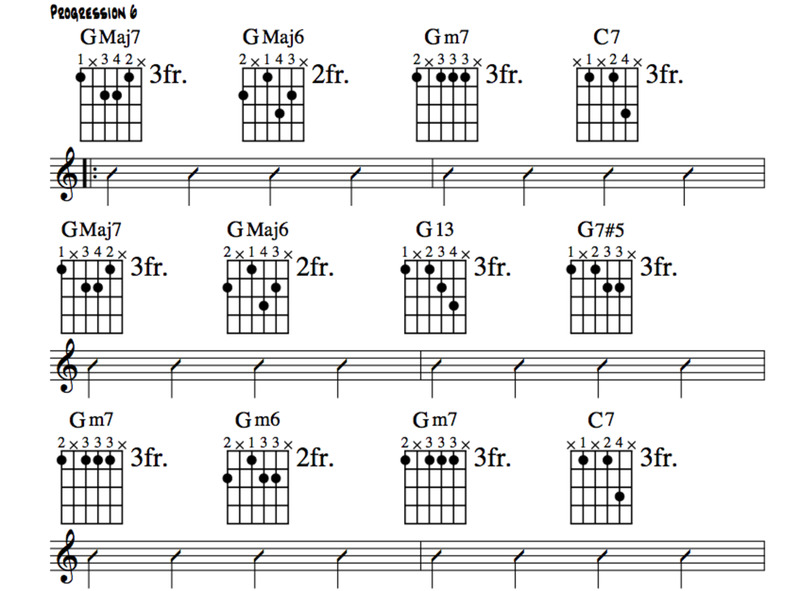 Hard to hit a bad sounding note, no matter what chord you are on, due to the minor and Major seventh chords. This is the main guitar melody with no bells and whistles. That is, no ornaments, such as bends, hammer-ons, pull-offs, etc. All of these notes are natural: diatonic to the key of C Major. Even though it is C Major, it is based in A Aeolian, the sixth mode of C Major. Scale spelling: A B C D E F G A (one octave). 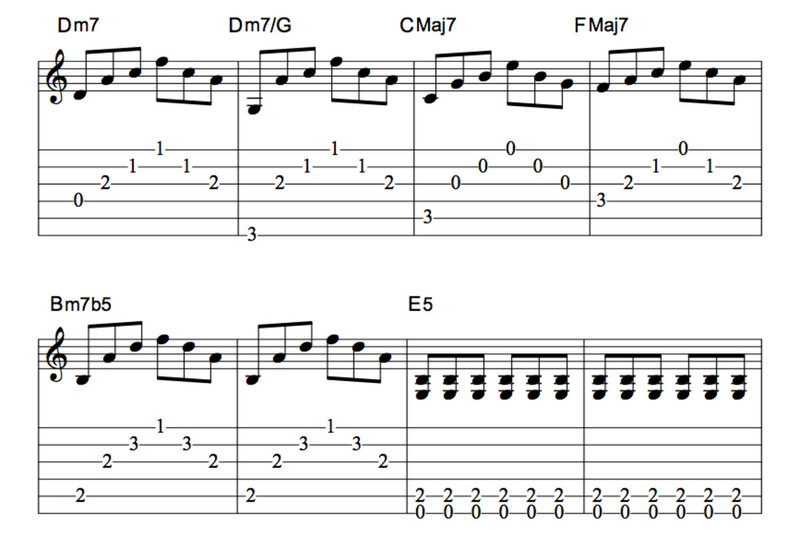 For more info on the modes, please see Modes Of The Major Scale. It is played at the twelfth position. 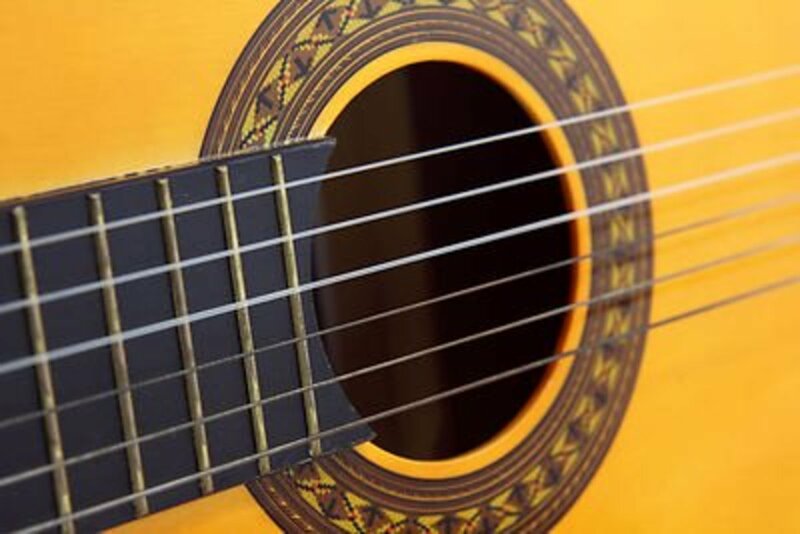 The twelfth fret is where the guitar neck starts all over again, usually symbolized by double dots as the fret marker. 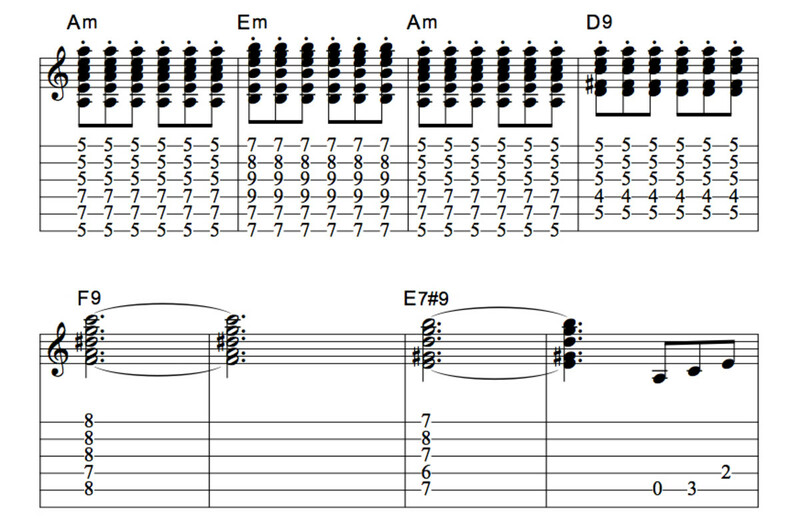 The notes at this fret are the same as the open strings (E A D G B E, sixth string to first), but sound an octave higher. The C Major pattern below is one of the easiest to improvise with, as it is contained in four frets, and is very symmetrical in shape. This version adds some bends to the the melody and is close to the actual song performance. The bend in measure two is a half bend (one fret). Bend the E natural into F Natural, hold the bend, then 'sneak' the fourth finger onto the high A on the first string. After striking the A, play the bent E (which is now at the F natural pitch) and release it back to the E natural before playing D in measure three. The same technique is employed in measures four and six. 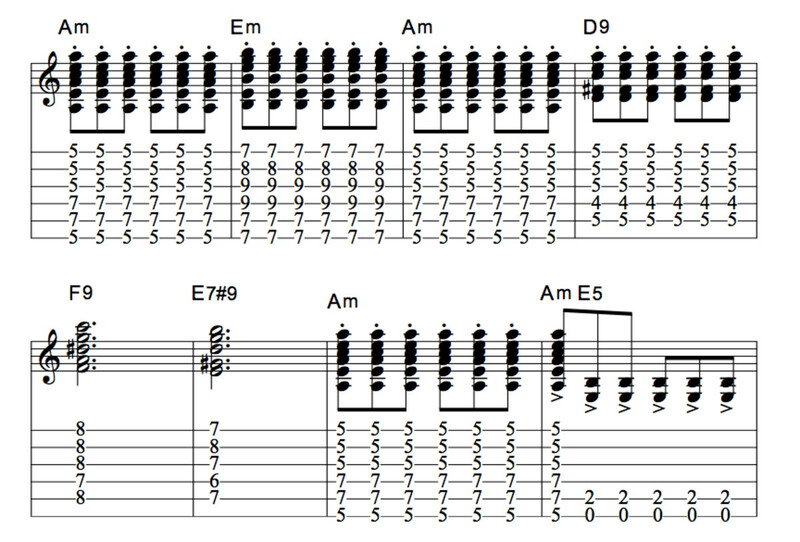 The bends in measure's four and six are full bends (two frets). In measure four, bend the D natural into E natural, hold the bend, 'sneak' the fourth finger onto the G on the high string, strike the G, then strike the bent D and release to the D at rest. In measure six, bend the C natural into D natural, place the fourth finger on the F on the high string, play the F, then strike the bent C and return to C at rest. The release bend (striking the bent string and releasing to the note at rest), creates a crying sound. When bending up, use a fortifying finger wherever possible (in this case, the third finger is fretting the bent note, while the second finger is fortifying the third finger on the same string placed in the fret behind). This is a very common technique and is used in all genres of music. 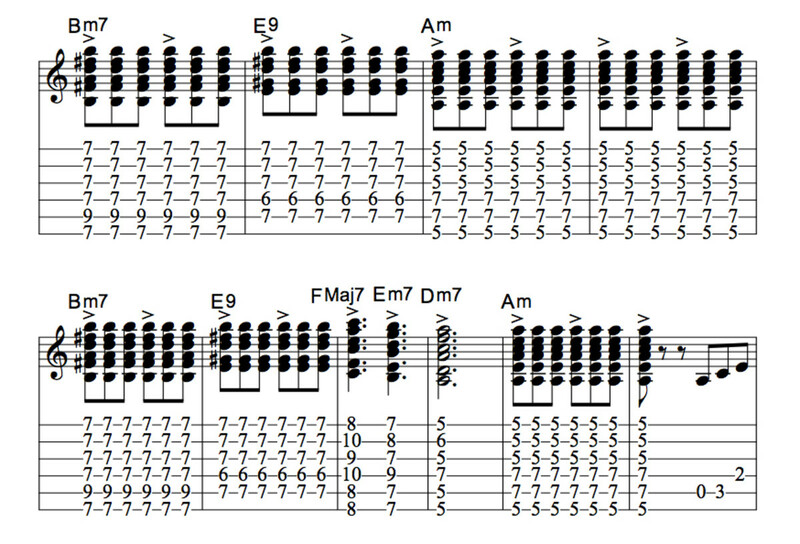 This version adds scale runs into the main melody notes. All the runs are strictly diatonic. This is an excellent way to add a bit of flash and interest to your solos. 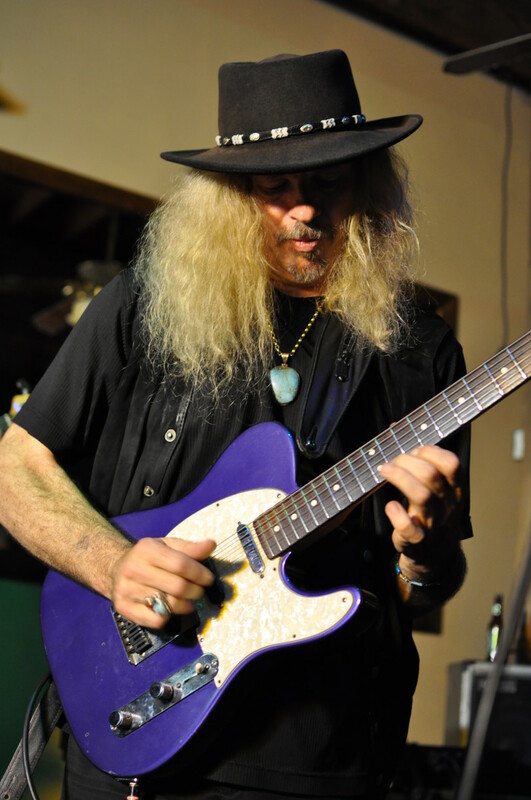 Many of the guitar virtuosos from the hair band era incorporated these runs into their solos, usually at lightening speed. However they do not have to be played fast, just accurate. 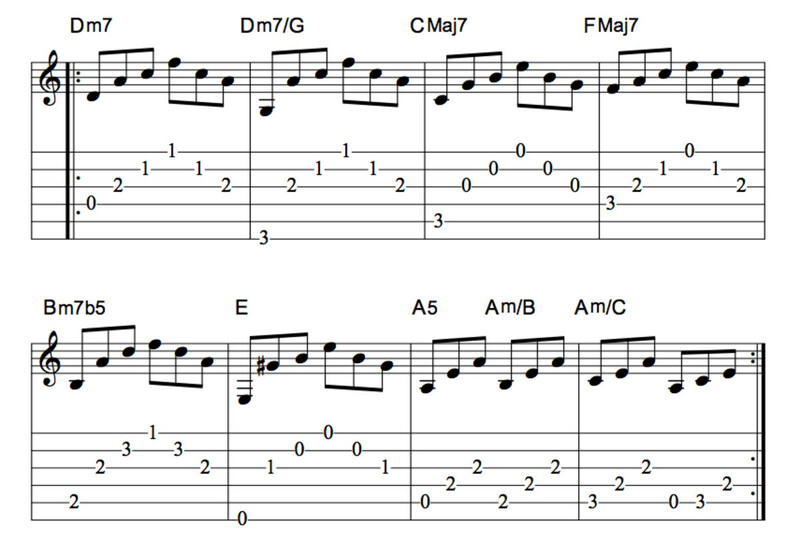 If we are talking in terms of modes, measure one outlines G Mixolydian, because of the starting note. This is the fifth mode of C Major (the parent scale). Measure three outlines E Phrygian, the third mode of C Major. Measure five would be considered D Dorian, the second mode of C Major. Each run was worked out as sixteenths from the second beat, but they still have a very strong melodic sound, that stands up even without the backing chords. Practice slow, make sure every note is accurate, then increase the tempo. I'm still in the beginner stage. 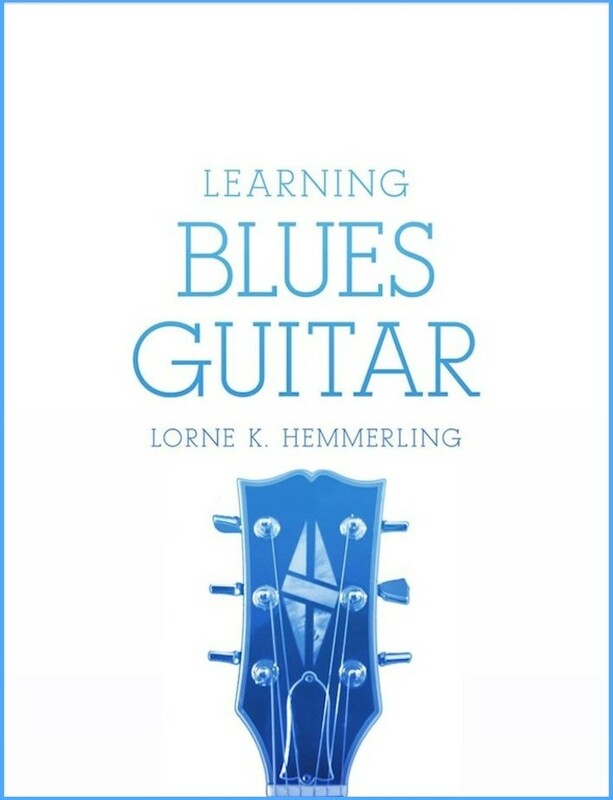 You make guitar playing look so easy! I'll practice this step by step and, with you're help, someday put it all together. Please keep up the great work! Thank you Edmunds! One of my favourite songs too. This is an excellent lesson! Big thanks for your work to allow us to study this great tune! Thank you, my friend. This one did take a bit of work to put together. i love this song, and this is a great lesson to learn! thank u for sharing! Thanks very much, Vincenzo! The one thing that keeps me doing these lessons, is the positive feedback and compliments. When you see the same students, in person, every week, things can get a little stale. I have always fancied myself as somewhat of a writer. Runs in the family. The fact that I can get things across clearly in writing, is heartwarming. Thanks again! Thank you for another great tune/lesson-your approach is very clear. Looking forward to the melody. Groove on, Lorne! You're welcome, my friend. Always great to get feedback. 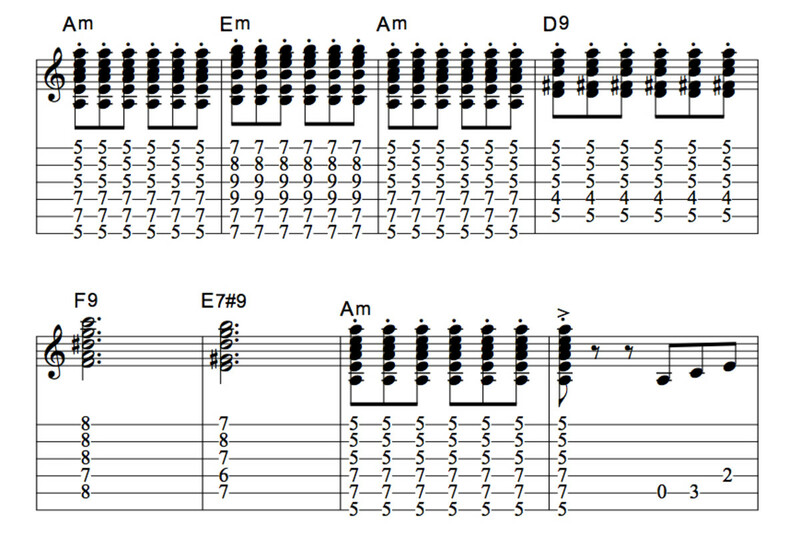 I will be posting a lesson on the main melody line for this song, soon. Thanks again for the compliment!